359 people in our community are currently praying with you. And the angel of the Lord called to Abraham a second time from heaven and said, "By myself I have sworn, declares the Lord, because you have done this and have not withheld your son, your only son, I will surely bless you, and I will surely multiply your offspring as the stars of heaven and as the sand that is on the seashore. And your offspring shall possess the gate of his enemies, and in your offspring shall all the nations of the earth be blessed, because you have obeyed my voice." Now after these things it was told to Abraham, "Behold, Milcah also has borne children to your brother Nahor: Uz his firstborn, Buz his brother, Kemuel the father of Aram, Chesed, Hazo, Pildash, Jidlaph, and Bethuel." (Bethuel fathered Rebekah.) These eight Milcah bore to Nahor, Abraham's brother. Moreover, his concubine, whose name was Reumah, bore Tebah, Gaham, Tahash, and Maacah. 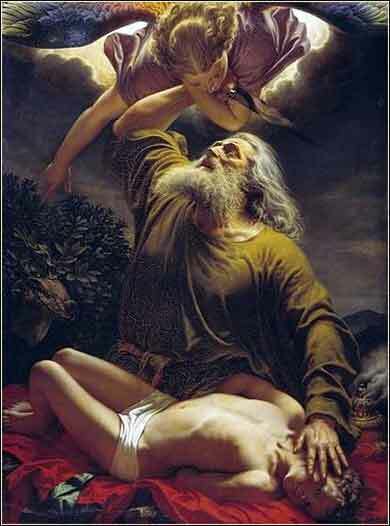 Yesterday we discussed how the Bible uses Abraham as an analogy to God Himself. We can never truly know the mind of God, but we can understand the pain of Abraham in offering His only son as a sacrifice for us, because Abraham is a man, like us. It is also prophetic of Christ, for Abraham tells Isaac that God will provide a lamb to be sacrificed, as payment for sin. In today's passage, an even more marked prophecy is made, as God's angel promises that "all the nations of earth shall be blessed" by Abraham's faith. God has repeatedly promised Abraham that he will father a great nation, the Hebrews; but the prophecy extends here all the way to Christianity, for by Abraham's faith and the offering of Isaac as a sacrifice, God promises to bless all the world. Moreover, this blessing will come from Abraham's offspring. And, indeed, Jesus will be able to trace his ancestry all the way back to Abraham. As if to demonstrate, the end of the passage give us an accounting of the children of Abraham's second brother, Nahor, and all his children. They will not be important (except perhaps to provide odd names for our ancestors), with one exception: we will be seeing Rebekah again.